Shower Panel Height: 47 1/4"
Shower Panel Width: 7 7/8"
Shower Panel Depth: 3 1/8"
Hand Shower Hose Length: 70"
Amazing shower panel perfect for the cost. It works fine and everything about the shower panel is great. I've seen the other shower panels here and none of them caught my eye the way this one did. I totally love the stainless steel finish - it looked so sleek and stylish - coupled with the design, it looks absolutely stunning. The features all worked so well - the rainfall massage, the horizontal sprays, the handheld - there is really nothing I can complain about. This is a great product overall - from design to function and everything else in between! I really wanted to have a shower panel installed in the bathroom so I got this when I saw that it was on sale. I thought the installation would be easy since it came with a manual but then I was wrong. It was somehow a challenge to put this thing into place, and the installation manual was missing from the box so I had to contact them and ask them to email it to me. Waiting for the email made it even worse since it came about a day later. I chose a shower panel because it is so much easier to install and it costs a lot less than buying separate head and massage nozzles. The price is really attractive and the design is very classy, the only complaint is the low water pressure of the jets, I almost cannot feel them at all. I had the same problem with the one I had before, so maybe it's because of our mains, but still it is very disappointing. 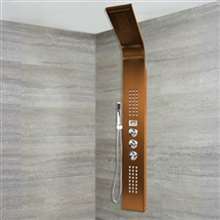 I really liked this shower panel because of the clean and minimalist appeal. Those are actually the reasons why I got this one. I don't know exactly what happened, but the one that arrived at my doorstep wasn't this. It didn't look anything like this at all. I had this shipped back to Fontana and I had to wait three weeks before they were able to send me the right product. In all fairness though, the shower panel was great.